If you enjoyed watching The Great Interior Design Challenge then you might wonder what happened next for your favourite finalists. Well, even the runners up are winners on that show, with several of them going on to carve out very successful new interior design careers. Lucy Tiffney appeared on the series almost three years ago and although she didn’t win the final, her background as a textiles designer and hands on approach certainly made her stand out. Any professional designer would struggle to deliver a finished scheme in just one week so all the contestants did extremely well considering the pressure and it was clear that experience in the field was advantageous. Having worked in television myself I understand the punishing nature of shooting schedules, so when I had the pleasure of bumping into Lucy at a trade show I just had to ask how did she did it. Hilariously she was not sure herself! 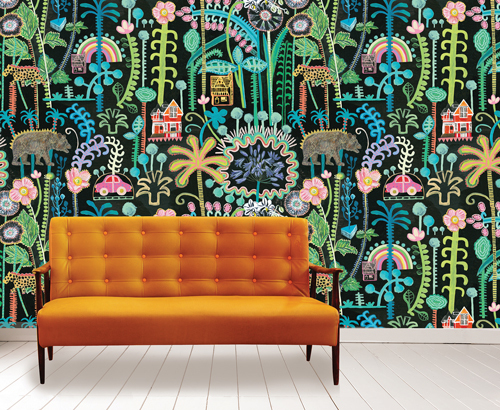 Since the show Lucy has been busy building her own brand of wallpapers, fabrics, cushions and so on using her talent for mural painting. Always colourful and cheerful her decorative designs showcase her sketchy style and painterly hand. Inspired by nature, the patterns Lucy creates are full of fronds and foliage in a variety of exotic colourways. Her wallpapers are busy and fun, and as such are particularly well suited to livening up utility rooms, hallways and under-stair loos, but just as the weather starts to turn chilly you might prefer to cosy up with one of her brand spanking new blankets. Or even adorn a wall with one. They are works of art after all.